Appearance: The front side consists of upper front grille and sleek headlamps. The broad sporty alloy wheels give an aggressive look to the car. The body colored door handles, rear side mirrors and large tail lamps provide an elegant look. Comfort: The legroom and head room are sufficient. The car has four spoked power steering wheel. Control is mounted at the steering wheel. Tata Aria is fitted with a hi-tech six speaker audio system, CD player, USB/Bluetooth connectivity, dual air conditioning with automatic climate control and cruise control, dimming roof lamps and in-dash built in GPS. The roof is fitted with mini glove boxes. There are bottle holders in door pockets. The second and third row seats are foldable. Handle bars are fitted at both ends for the passengers. Safety: Tata Aria as various safety features. The car is likely to come with six airbags. There are seat belts for all the passengers. Tata Aria is fitted with fog lamps and parking sensors. The car would be supported by standard controls, cruise control and stability control. The brakes are disc type coupled with ABS and Electronic Stability Programme (ESP). 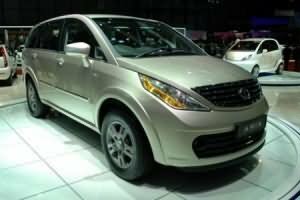 Tata Aria is one of the safest vehicles due to stiffened body cage, dual zone collapsible steering and chasis frame comprising advanced hydro formed numbers. Engine: Tata Aria has new generation engine which can be described as 2.2 L DICOR (Direct Injection Common Rail) diesel power train. The engine churns a power of 140 bhp at 4000 rpm and a torque of 320 Nm at 1700 to 2700 rpm. It is supported by 16 valves (4 valves per cylinder). The engine is equipped with Variable Turbine Technology (VTT) and five speed manual transmission. Price: The price of Tata Aria would be Rs.12,00,000. It is tentative price taking Mumbai as base price location. The price specified is approximate price which excludes tax, registration, insurance and cost of accessories.